You can make a basic arpeggiated melody more interesting by messing with the probability and repeats parameters. The latter are also reflected in the timeline (top). 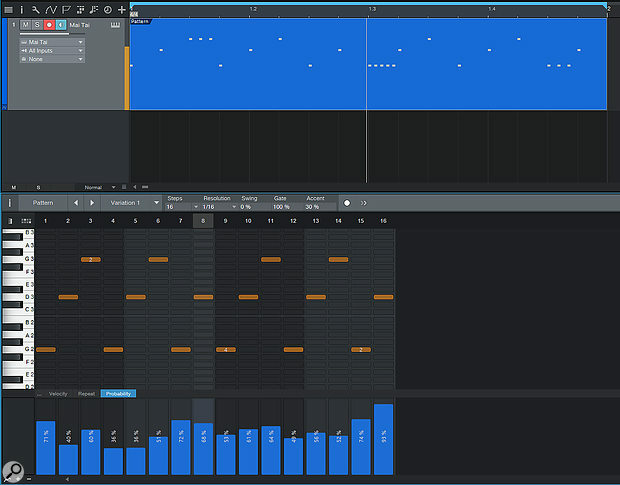 Studio One 4 introduced pattern-based step sequencing as an alternative mode to the familiar piano-roll MIDI editor. It's one of those features that makes you wonder why every DAW doesn't already have it. It's simple and intuitive in a way that's reminiscent of the creative tools we've come to enjoy in hardware. 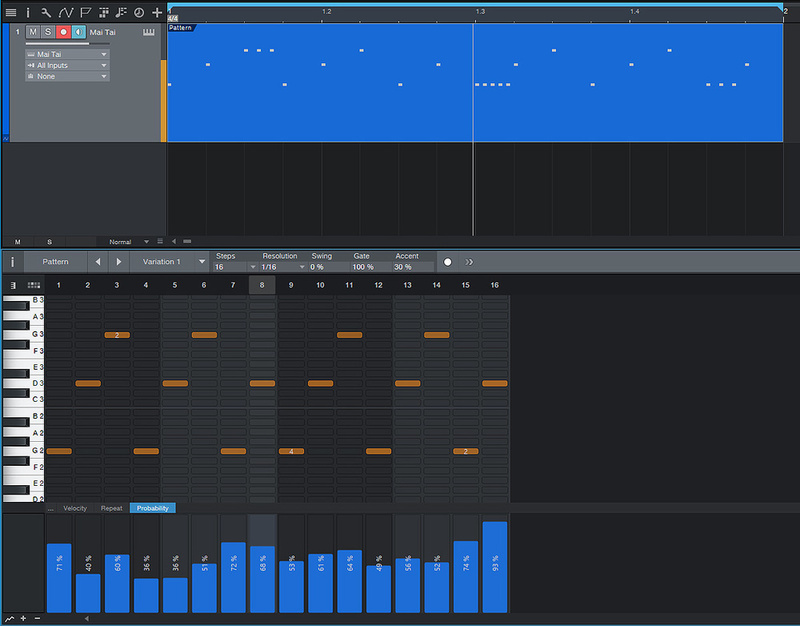 Pattern-based sequencing is most often used for drums, but as we'll see in this month's workshop, the Pattern Sequencer in Studio One can be just as easily directed to synthesizer and instrument sounds, and can very quickly generate something unexpected. There are a few notions you need to get your head around in order to not find yourself befuddled by Studio One's pattern system. The first hurdle to overcome is how to put a pattern onto your timeline. The process feels quite convoluted at first, because there's little connection or flow between patterns and instrument parts such as MIDI clips. Ignore your desire to right-click or search around in menus: the Insert Pattern keyboard shortcut is the way to go. Click in the timeline where you want to put a pattern, select the track that it's for and hit Ctrl+Shift+P for instant pattern insertion.